Clark Stationery - Carlson Craft - Embossed Dots. To see all designs from Carlson Craft click here and be directed to a sister site. Item Name: Embossed Dots. To see all designs from Carlson Craft click here and be directed to a sister site. 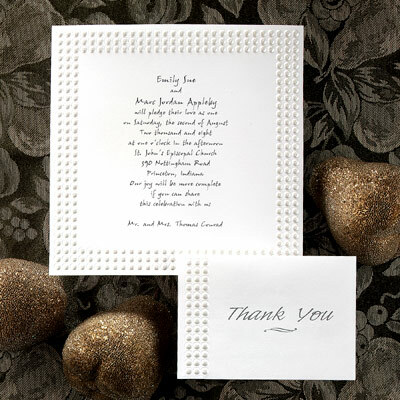 Description: Carlson Craft offers a variety of wedding invitations in traditional styles as well as unique styles, all at affordable prices. To see all of the Carlson Craft wedding invitations online with their matching reception cards, response cards and other accessories, click on our our sister site and be directed to a more comprehensive site where you can choose fonts, see proofs and order directly online. Or, as always, feel free to make an appointment to see samples. Pricing: $146.90 for 100 of this invitation. Click here to see pricing for each invitation.